Chicken Lollipop is just a fancy way of serving chicken wings. 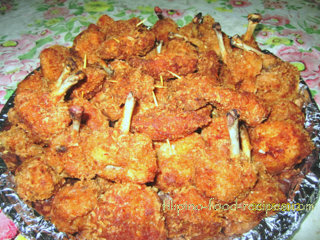 It is a perfect finger food for parties and kids definitely love them. The wing is cut in 3 parts, the wing, drummette(small drumstick) and wingtip, with the wingtip discarded or tossed with chicken bones for broth. The drummette's meat is scraped towards the meaty end to look like a lollipop. 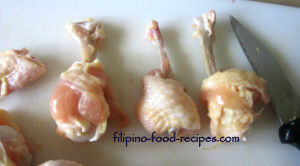 Depending on the size of the wing, it can be made into 1 lollipop chicken or cut in the center and made into 2 small ones. In some wet markets in Manila, you could ask your meat guy to 'lollipop' your chicken wings for a small fee. The recipe is just a simple dredge and fry -- but you will have to refrigerate after dredging to make the breadcrumbs stick better and not fall off the oil during frying. The dredge is dry/wet/dry : meaning dredge in flour, then in the beaten egg, and lastly in the breadcrumbs. Lastly, to make sure the chicken are seasoned properly, salt and pepper are sprinkled immediately after taking them out of the hot oil. 1 Prepare the chicken wings by cutting the wing from the drummette. 2 Scrape the drummette meat from lean end to the meaty end, forming a lollipop shape. Season with a little salt and pepper. 3 Dredge lightly in mixture of flour and paprika, shaking off any excess, then dip in the beaten egg. 4 Finally, dredge in the seasoned breadcrumbs, then refrigerate for an hour for breading to set. 5 Deep fry in hot oil until golden brown. 6 Season immediately with salt and pepper. NOTE : Another breading option is to use the batter recipe in Shrimp Tempura.